Blowing/ wind toys. Pin wheels, bubbles and straws with feathers to poke feathers in the end and see the effect of "wind" and blowing around floor/ up in air. Make fire streamers, a really popular activity. This activity needed 100% adult support which I tend to avoid during this part of the session but I felt the end justified the means. This was very popular. After separating the tinsel into lengths and taping bunches together to make the creating of the streamers easier I was left with all of this! So decided to just use it as a sensory activity related to fire. 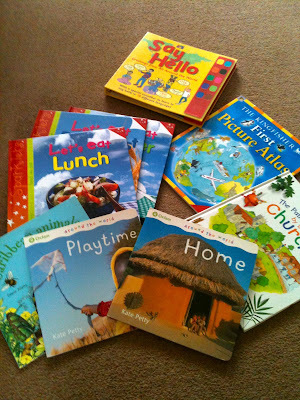 Books related to different languages and cultures, in relation to the friends speaking different languages and going out into the world to tell of Jesus. 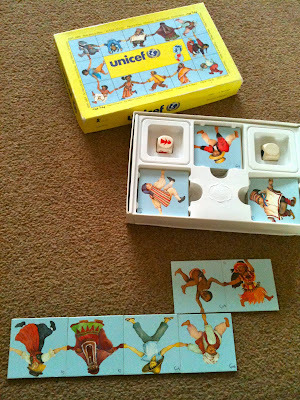 Unicef game, where you join childrens hands from different ethnicities. Again related to going out to tell of Jesus. I think it is wonderful how you have taken inspiration from Godly Play, but made the ideas your own.